One of the basic tools in any construction or remodeling project is the measuring tape. Understanding how to read it will be the knowledge that you will use more than any other skill learned in the industry. From the beginning of the age when man started constructing shelters to protect himself from the elements, he has had a way to determine how large or small something should be. People as early as fifty years ago used broomsticks or the distance between the floor and a doorknob to ascertain the measurement of something else. Learning the difference between 1/8 of an inch and ¼ of an inch can be the difference between something fitting in place or not fitting. Only basic math skills are required. Place the end of the measuring tape against the wall on top of the vanity in your bathroom and pull it out to the front edge of the top. Most vanity tops are 21 inches deep. Notice that the measuring tape is broken down in inches. Twelve of these equal one foot. Divide 21 by two. The answer is 10 ½ inches. This mark is the center of the vanity top and marks where the center of the sink will be. Dead center between two of the one inch marks is the ½ inch mark. These look the same all the time. Stretch the measuring tape from the floor to the top of the vanity. It should be 30 inches. What is the measurement to the top of the cabinet? It is usually 29 ¼ inches. Between the ½ inch mark and the whole number before it is the ¼ inch mark. These also look the same all the time. Measure the length of the vanity and the depth of it. Multiply these two numbers and you will get the area of the vanity top in square inches. This information is helpful when deciding what style of vanity top will give the most usable surface. 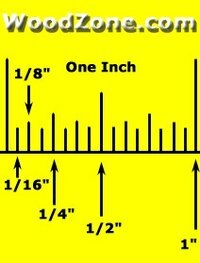 Measure the length of a 2 x 4 inch stud. It is 92 5/8 inches long. The next to the smallest measurement dealt with in most construction work is 1/8 inches. It takes eight of these to equal an inch. It takes four of these to equal ½ of inch, and so on. The math involved in breaking down the increments used on a measuring tape is division and starts with the division of each figure by two. Example: divide one by two and you get ½ . Divide ½ by two and you get ¼ and so on. Use a calculator until the method becomes easier. Notice how the numbers fit. It takes four 1/4 inches to equal one inch. What ever the number is on the bottom of the fraction is how many it takes to make one inch.